​My grandmother, Christine Lehl (born Nov. 1891), twice emigrated from Norka. In the 1800's, her father was wealthy by most standards, owning the grain mill in their village. He had a brother that had already settled in Nebraska due to religious reasons. He wrote my great-grandfather telling him of the great life there. They left and traveled to America, arriving through Ellis Island. After becoming established, he received another letter from a brother that remained in Norka reporting that things had changed dramatically for the better and requesting that they come back. The family departed for Russia and returned to Norka. Several years later, young boys were being taken to fight on the Siberian front. My grandmother had two brothers, and both were at risk. The villagers had heard rumors the Bolsheviks were coming to raid their village. During the night, the men of her village went to the church and scraped the gold off the angel's wings so the Bolsheviks couldn't steal it, removed artwork and anything else of value to hide. Christine vividly remembered the Mayor (Vorsteher) being killed, his wife raped and thrown in a ditch to die. Her father took what they could and fled, ending up in Nebraska again. She married Henry Peter Firestone (Feuerstein) who was born in 1889. Henry Peter's family also emigrated from Norka. My father was born in Schilling, Russia and immigrated to the US in 1915 at the age of 3. My grandfather came first to find housing and my grandmother came with my dad and his older sister. They also settled in Lincoln. Christine Lehl at age 17. Courtesy of Linda Haas. 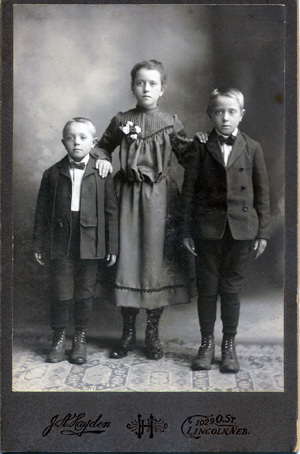 Lehl children: Conrad, Christine and Louis. 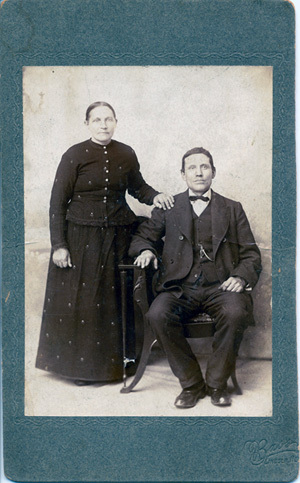 Photo taken in the late 1800s and provided courtesy of Linda Haas. Peter and Christine (née Brehm) Firestone (Feuerstein). Courtesy of Linda Haas. Courtesy of Linda Hass, Lincoln, Nebraska. If you have additional information or questions about this family, please Contact Us.